Chrichton's World: Review Extreme Prejudice (1987): Unpretentious B movie goodness! Review Extreme Prejudice (1987): Unpretentious B movie goodness! Extreme Prejudice is a modern day western directed by someone more than capable to do it right. Walter Hill knows his stuff (at least until he made Bullet to the Head that is). This film basically consists of two story lines that at one point get intertwined. One is about Texas Ranger Jack Benteen (Nick Nolte) who has to go against old friend and now crime lord Cash Bailey (Powers Boothe). And the other is about a military group (featuring Michael Ironside, Clancy Brown and William Forsythe) conducting a top secret mission. Now I do have to say that it does feel that there was more to these stories and how they crossed each other. But that a lot had been cut to save time. Wikipedia confirms this hunch and all I can say is that I hope to one day be able to see what Walter Hill's original vision was. Although as it is now is effective enough. Essentially (if I get it right) the idea was to put the people of both story lines together in one explosive finale. This finale while very satisfying did seem a little short compared to the time was taken to set it up. Still it's clear that this finale is a tribute to Sam Peckinpah and his The Wild Bunch. Short but sweet one could say. Extreme Prejudice is not a non stop action film. But whatever action is present is very good. It's gritty and violent. When the good guys die you care for them. This is because enough time is taken to tell the audience what they are about. Of course this in large part should be contributed to the excellent cast. Most actors clearly had fun playing their roles. One point of criticism I should add that this film doesn't seem to care about accurate portrayals and rather wants to stick to stereotypes. 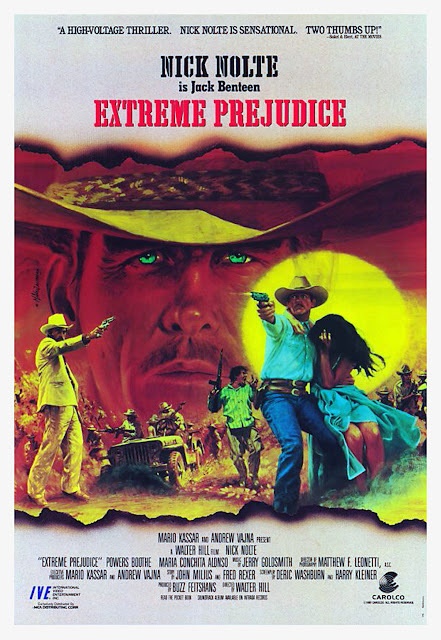 Extreme Prejudice is a lot of fun while watching it but it's also one that is not particularly memorable. I personally was expecting a lot more and while I got my action fix it did feel a little underwhelming. So keep your expectations in check and you will have a blast.